Former President Jimmy Carter did not vote for Democratic presidential candidate Hillary Clinton during the 2016 primaries, instead choosing the more progressive candidate, Sen. Bernie Sanders (I., Vt.). Carter, 92, revealed who he cast his ballot for Monday evening. He and Sanders appeared together at the Carter Center in Atlanta for a discussion on politics and human rights, the Washington Post reported. During the event, Sanders, a self-declared socialist, launched into a campaign-style speech in which he castigated corporate money in politics and lamented low voter turnout in the United States. "If we had 80 percent of the people voting in this country, the Republican Party would be a significant minority," Sanders said. "So we have got to get people involved. And you do that by being honest about the real problems they face and come up with real solutions." Carter then smiled, turned to the audience, and asked, "Can y'all see why I voted for him?" His comment drew laughter from the audience. 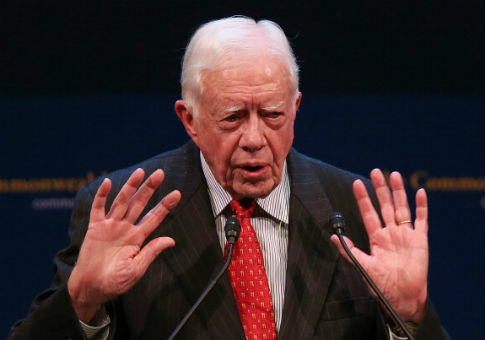 Carter and the Clintons have had a contentious relationship for decades. The former president refused to endorse Bill Clinton in 1992, saying at the time that "people are looking for somebody who is honest and tells the truth," the Post noted. In 1996, Carter skipped the Democratic National Convention altogether, despite being the only living former Democratic president. Twelve years later, Carter endorsed Barack Obama over Hillary Clinton, telling the latter that she had to "give it up." Carter did endorse and vote for Hillary Clinton in 2016 over then-candidate Donald Trump, but only after Sanders dropped out of the Democratic primary. The Georgia Democrat noted Monday that both Clinton and Trump are unpopular. This entry was posted in Politics and tagged 2016 Election, Bernie Sanders, Georgia, Hillary Clinton, Jimmy Carter. Bookmark the permalink.